The Soaring Eagle Urn is breathtakingly beautiful. The urn is crafted from polystone which is a mixture of crushed stone and resin and then molded. 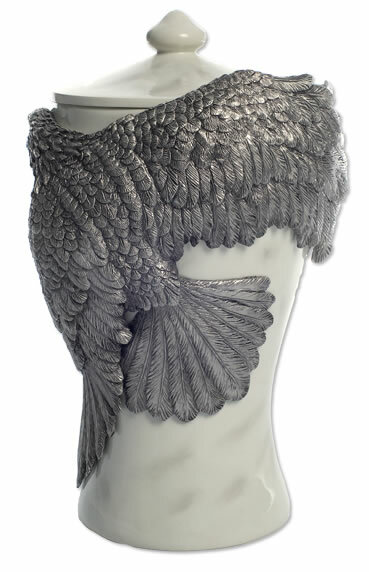 It is then finished in a look that resembles carrera marble which is the perfect background for the beautifully detailed pewter eagle in flight. The eagle is a symbol of strength, courage, and immortality, and an eagle with open wings symbolizes protection. Therefore, this is the perfect final resting place for the soldier, veteran, or any person who showed strength and courage. 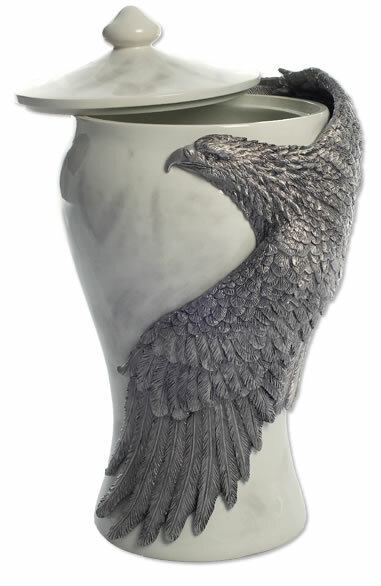 This urn is also perfect for the person who loved the outdoors, wildlife, or eagles. Click on the gray tab called Detailed Images to view other angles of the urn. Cremains can be easily loaded through the lid. The lid can be sealed with any household adhesive. As with all urns, it is recommended that cremains be in a sealed plastic bag inside the urn. 16" tall x 9" wide and holds 230 cubic inches which is large enough for most people with healthy body weights up to 220 pounds. Urn usually ships same business day if order is placed by 2pm Eastern Time. Ships from the West Coast.